Election Day is here, and New Yorkers can look forward to an innovative way to stay informed about who gets elected. Through a collaboration with Instagram, CA Technologies, Obscura Digital, and the Empire State Building itself, CNN is projecting the election results on the Empire State Building, starting at 8 p.m. EST. The projection on the south facade of the famous skyscraper will help voters keep track of how many electoral votes their candidate of choice has. The display includes "photography, real-time election results, maps, voter mosaics, and animations," according to CNN. It also includes a countdown clock that tracks when polls close throughout the United States. And when the final election results come in, the face of America's next president will be broadcast across the New York City skyline. 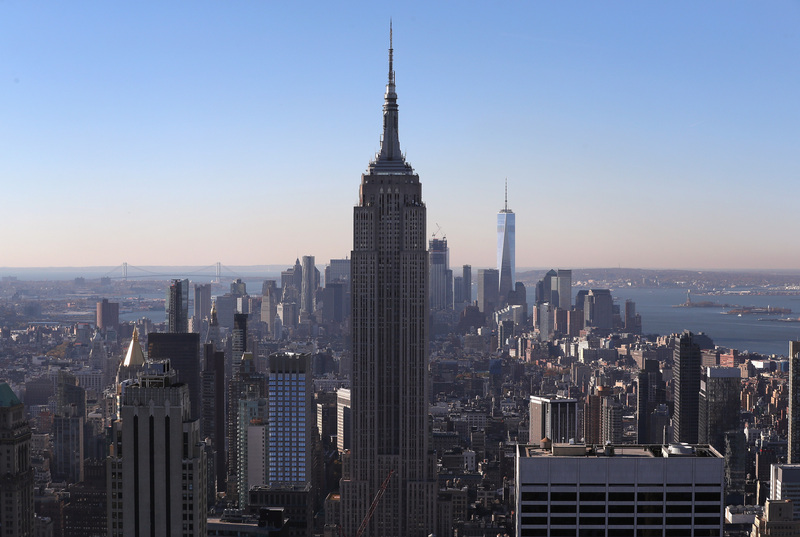 And if you've ever used the hashtag #MyVote to share an election-themed image, your creation may well be featured on the side of the Empire State Building, CNN reported. "We wanted to break the fourth wall," Ed O'Keefe, a CNN senior vice president told the Washington Post. "We wanted to make a connection between the television program, which is very much speaking to people, and this election, which has fostered so many emotions and conversations among people." This isn't the first time the Empire State Building has played host to projections, but it is possibly the most ambitious project yet, the Post reported. The projection is immense; it covers 70,000 square feet and has been created with 40 projectors, O'Keefe told the Post. This makes sense, seeing as the projection is the finale of CNN's #MyVote nationwide tour, during which CNN correspondents traveled across the United States and interviewed voters. Fittingly enough, both Hillary Clinton and Donald Trump's election night gatherings, including the candidates themselves, are within walking distance of the Empire State Building. Both candidates have ties to New York; Clinton was the state's senator from 2001 until 2009, and Trump was born in New York City. If you're not in New York City, don't worry. You can still watch the Empire State Building either on CNN's television channel, online at CNN's website, or through CNN's Facebook page, which is live-streaming the event. And while it may be the biggest projection screen in the United States tonight, the Empire State Building isn't the only facade to display CNN's election-related news. Washington, D.C.'s Newseum, as well as Las Vegas' Miracle Mile shopping mall will be displaying election results as well, according to the Washington Post.